Length of substitute service is discriminatory and punitive. Under present law, conscientious objectors (COs) can have their status repealed if they refuse to perform the punitively long substitute service. This is contrary to Article 4 of UN Commission on Human Rights Resolution 1998/77 which states that "States with a system of compulsory military service, where such provision has not already been made, of its recommendation that they provide for conscientious objectors various forms of alternative service which are compatible with the reasons for conscientious objection, of a non-combatant or civilian character, in the public interest and not of a punitive nature". Previous UN Human Rights Committee rulings - most recently Foin vs France - decided that: any disparity in length is only permissible if it is based on "objective and reasonable criteria, such as the nature of the specific service concerned or the need for a special training in order to accomplish that service" and any disparity in length that discriminates against COs on the basis of their conscience constitutes a violation of the principle of equality set forth in article 26 of the Covenant. It is also contrary to the recommendation of the Committee of Ministers of the Council of Europe R87(8), which states that "the duration of service should be reasonable and should not be tantamount to a 'punishment'"
Greek CO law excludes whole groups from applying for CO status. There is no case by case decision and the capacity to change one's convictions is not taken into account. Conscientious objectors should have the right to claim conscientious objector status at any time, both up to and after entering the armed forces. At present, there is no possibility to apply during or after military service and professional soldiers are excluded entirely from applying for CO status. This is despite the fact that 2 UN Commission on Human Rights resolutions recommend that this is not the case. Resolution 1993/84 "affirms that persons performing compulsory military service should not be excluded from the right to have conscientious objections to military service" and the later resolution 1998/77 recognises that "persons performing military service may develop conscientious objections". At present, bureaucratic procedures prevent people from exercising their right to CO. Substitute service must be under civilian authority and not under military authority (Ministry of Defence) - including in the examinations of applications for conscientious objection. At present, Article 20, paragraph 1 and Article 21, paragraph 3 (d) of Law 2510/97 put substitute service de facto under partial military authority. Bringing the substitute service under civilian authority would fulfil Article 3 of UN Commission on Human Rights Resolution 1998/77 which calls on states to "establish independent and impartial decision-making bodies with the task of determining whether a conscientious objection is genuinely held in a specific case". The provision of substitute service must never be derogated from, including in time of war. Although Article 4 paragraph 1 of the International Covenant on Civil and Political Rights (ICCPR) provides for special measures in time of public emergency which threatens the life of the nation, paragraph 2 of the same article states that: "No derogation from Article 6, 7, 8 (paragraphs 1 and 2), 11, 15, 16, and 18 may be made under this provision". Under present procedures, COs are tried more than once for the same offence. This is clearly in contradiction to Article 5 of UN Commission on Human Rights Resolution 1998/77 which states that "States should take the necessary measures to refrain from subjecting conscientious objectors to imprisonment and to repeated punishment for failure to perform military service, and recalls that no one shall be liable or punished again for an offence for which he has already been finally convicted or acquitted in accordance with the law and penal procedure of each country"
It is also in contradiction to Article 14 paragraph 7 of the International Covenant on Civil and Political Rights(ICCPR): "No one shall be liable to be tried or punished again for an offence for which he has been finally convicted or acquitted in accordance with the law and penal procedure of each country." It also contravenes Commission on Human Rights resolution 2002/45 which takes note of recommendation 2 of the Working Group on Arbitrary Detention aimed at preventing the judicial system of States from being used to force conscientious objectors to change their convictions. At present, conscientious objectors who carry out trade unionist activities or participate in a strike during their substitute service can have their CO status revoked. This contravenes Article 6 of UN Commission on Human Rights Resolution 1998/77 which states that "States, in their law and practice, must not discriminate against conscientious objectors in relation to their terms or conditions of service, or any economic, social, cultural, civil or political rights". Conscientious objectors (with legal proceedings against them) must recover their full civil and personal rights, including that of travel outside the country, the right to a passport and identity card, and the right to vote. The practice that COs on trial have their civil and personal rights revoked is in contradiction to Article 14, paragraph 2 of the International Covenant on Civil and Political Rights (ICCPR) which states that "Everyone charged with a criminal offence shall have the right to be presumed innocent until proved guilty according to law." This report focuses on the situation of conscientious objectors in Greece. Greece was the last European Union country to recognise the right to conscientious objection when it finally did so in 1997. However, despite this recognition, there remain several problems and discriminatory practices against conscientious objectors. The issue of conscientious objection in Greece is complex, with certain groups being excluded at the outset from applying for CO status and with the obligation to adhere to strict procedural guidelines for those who are eligible to apply. Moreover, the provision of substitute service for conscientious objectors is riddled with complications and thus further discriminates against COs.
Whilst, this report looks at conscientious objection in Greece, it is worth noting here that the numerous issues and problems with the laws, procedures and practices relating to conscription and to conscientious objection in Greece have wide-ranging and serious social implications for Greek men of conscription age and their families. Many of these such as substitute service forcing COs away from the labour market and their families for lengthy periods are touched upon in the report. However, in addition to these issues, numerous problems arise from the sheer number of conscripts who avoid military service through alternative 'side-door' means. For example, conscripts may go into hiding, move abroad or 'play the crazy card'. As such, they are unable to participate in Greek society which of course impacts on Greek political, social and economic life, especially via the labour market. 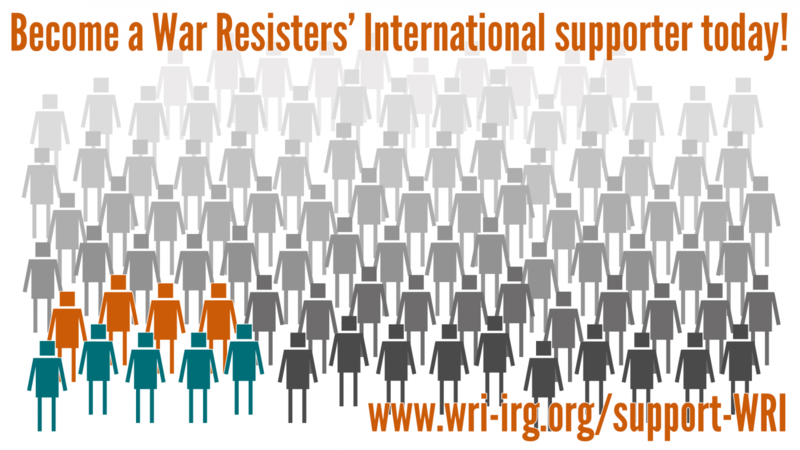 War Resisters' International closely monitors the situation of conscientious objectors in Greece and works together with the Association of Greek COs (Óõíäåóìïó Áíôéññçóéùí Óõíåéäçóçò - SAS) and Amnesty International Greek section to highlight the numerous and frequent violations of the human rights of Greek COs by the Greek authorities. This report is based on information from official Greek military material, case studies of individual Greek conscientious objectors and previous reports and research by WRI, SAS and AI. It refers to several national, European and international laws and draws on the recommendations of numerous Greek, European and international bodies. The report focuses primarily on the recommendations of the United Nations, and although other standards are referred to, for the most part, we have avoided quoting too many recommendations by other bodies (such as the Council of Europe) in order to avoid unnecessary duplications. The 'main concerns' outlined above are the core problems relating to conscientious objection and its recognition in Greece. This report will illustrate how the situation in Greece constitutes a violation of several national and international laws and resolutions, and thus calls for Greece to make the necessary steps to come into line with internationally recognised standards. Conscription was established, directly and expressly, in Article 4, paragraph 6, of the 1975 Constitution. According to this all Greek males who are capable of bearing arms - with sole essential criteria being their physical and mental capacity to bear arms and respond to military life - are obliged to contribute to the country's defence, as determined by the law. Conscription is further regulated by Law 731/1977, as amended in 1988 (1763/1988). All Greek menfrom the first of January of the year during which they become 19 years of age until the 31st of December of the year during which they complete their 45th year are obliged to serve in the Armed Forces. This includes all males born to either a Greek father or mother, who automatically acquire Greek citizenship and thus become liable for military service - regardless of whether they wish to possess Greek citizenship and regardless of whether they also hold citizenship of another country. In practice, the majority of Greeks complete their military service between the ages of 20 and 30. Reservist obligations apply up to the age of 50; reservists are periodically called up for reservist training. According to current legislation, the duration of full military service is twelve (12) months for the Army, Navy, and Air Force. Subject to the periodic needs of the Armed Forces, and after a decision of the Minister of Defence, it is possible that enlistees will be released either before the completion of the military service or, in some cases, after a longer period of service. In certain cases, conscripts or soldiers are eligible for reduced service - to 3, 6, 9 or 12 months. Those eligible include (but are not confined to): the widowed father of at least one alive minor or unfit for any work child, one who served under a military capacity in the regular armed forces of another state for a period of time of at least six months, anyone who has an unfit for work wife, the only or the eldest son of deceased parents. Conscripts coming under the following categories are eligible for deferment of their military service: students, candidate students of higher school or university and those obtaining sea service, those with a brother in service, permanent foreign residents, persons serving for the Armed Forces of a foreign Country, those signed up as sailors, naturalized aliens, persons coming from a country of the former Eastern Block or Turkey, hospitalised, confined or exiled persons and deferment on certain medical grounds. Older conscripts are granted the possibility to serve only a certain part of their military service and, according to their age and marital status, buy off the remaining time. The right to conscientious objection is legally recognised with the 1997 Law on Conscientious Objection (2510/97), which came into effect on 1 January 1998. According toarticle 18, paragraph 1 of this law, "Those who invoke their religious or ideological convictions in order not to fulfil their draft obligations for reasons of conscience, may be recognized as conscientious objectors". Applicants for CO status are expected to make out a specific case relating the grounds of their objection "with a general perception of life, based on conscientious religious, philosophical or moral convictions, which are inviolably applied by the person and are expressed by a corresponding behaviour" (article 18, para 2). It should be noted that the amendment to the constitution which recognises CO status on non-religious grounds was made only recently - in 2000. There are no legal provisions for conscientious objection for professional soldiers. The Law on Conscientious Objection applies only to conscripts. persons who have already reported for armed duty either in Greek or foreign military forces or any security forces (like customs, police etc. ), non regarding its length. persons in possession of a hunting permit or having applied for one or being active in hunting associations. This means that all hunters, about 300,000 Greek men in the age for conscription, are excluded. persons who have been prosecuted or sentenced for the possession of arms or ammunition, or illegal use of violence. So even if the prosecution was based on wrong assumptions, the person is excluded from the acknowledgement as a CO. Acknowledgement of CO status comes only through a decision of the Defence Minister based on the statement of a committee which is made after reviewing the application or after a personal hearing. According to Article 20 of Law 2510/1997, all CO claims are examined by a special committee which falls under the authority of the Ministry of Defense. The committee consists of one legal expert who acts as chairperson, two university professors (specialised in the fields of political science, sociology or law) and two military officers of high rank (one from the recruitment office and one psychiatrist of the armed forces). Applicants may be ordered to participate in a personal interview with the commission, during which they are expected to make their case relating the grounds of their objection "with a general perception of life, based on conscientious religious, philosophical or moral convictions, which are inviolably applied by the person and are expressed by a corresponding behaviour" (as laid down in Article 18, para 2 of the Law). The committee makes a consultative decision but the MOD usually accepts the decisions of the committee. If an applicant is refused CO status, he can make an appeal and a petition for postponement of the enlistment, which he must bring to the authorities within 5 days from the date he makes the petition. According to par. 4 of article 18 of the Law, applicants must produce a variety of documents & certificates - such as a copy of the applicant's criminal record proving that a person has not been convicted or even prosecuted of a violent crime, a certificate from the local Police Station verifying that a person has not applied for a gun licence and another certificate from the Forest Public Service confirming that a person does not have a license for hunting. The time limit for submitting CO applications states that applications can only be made before starting military service - the deadline is the day before enlistment. "the conscientious objectors are called up to offer either an unarmed military service or an alternative civil or social service"
The Greek law on CO was amended in August 2004, so that now conscientious objectors complete their substitute service after serving twice the time of military service minus 1 month. In theory this amounts to between 5 and 23 months, but in practice in most cases it amounts to 23 months of service. COs serving substitute service are entitled to free food and shelter, according to article 21 of Law 2510/1997, and if this is not possible the present salary of COs serving the Substitute Service is 210,70 euros. Unarmed military service is from 4 months and 15 days to 18 months. By denying the right to conscientious objection to any person falling within the strict categories listed above, including to serving conscripts, reservists and professional soldiers, the law relies on an extremely narrow definition of "religious or ideological convictions" and does not allow for the capacity to change. Although Greek law recognizes the right of conscientious objectors to switch at any time from substitute service to military service, it contains no provision for conscientious objection developed during military service - the possibility of which is recognised in UN Commission on Human Rights resolutions 1993/84 and 1998/77: "persons performing compulsory military service should not be excluded from the right to have conscientious objections to military service"(1993/84) and "persons performing military service may develop conscientious objections" (1998/77). In fact the law actively excludes serving conscripts from applying for CO status. The exclusions apply even to CO applicants who have been prosecuted but not charged for the possession of arms or ammunition, or illegal use of violence. This is in contradiction to Article 14, paragraph 2 of the International Covenant on Civil and Political Rights (ICCPR) which states that "Everyone charged with a criminal offence shall have the right to be presumed innocent until proved guilty according to law." Due to the strict deadlines and bureaucracy involved in the provision of certificates, in several cases, applicants have not been able to respond in time for the CO application deadline because many public services do not issue the various documents/certificates that are required by the recruitment office in a timely manner. The deadlines and the exclusions above do not take into account the fact that information on the option of CO is not made freely available to potential conscripts. This lack of information paired with the sporadic referral of CO applicants to the relevant authorities often results in applications for CO being initiated when it is too late and their right to apply for CO has already been revoked. This lack of information is contrary to Article 8 of the UN Commission on Human Rights resolution 1998/77 which "affirms the importance of the availability of information about the right to conscientious objection to military service, and the means of acquiring conscientious objector status, to all persons affected by military service". This lack of transparency is also apparent in the fact that applications must be made to the Ministry of Defence. The interviewing committee for CO applicants is set up and controlled by the MOD and contains 2 members of military personnel. Given that the military has an active interest in keeping the number of COs to a minimum, in order to be fair and impartial, applications should be considered by an entirely civilian panel void of conflicting interests and the entire process should be overseen by a civilian body, as called for in Article 3 of the UN Commission on Human Rights resolution 1998/77. It is worth noting here that the laws, procedures and practices relating to CO in Greece often result in the real number of COs being distorted. For the reasons identified above, Greek men of conscription age (and potential COs) avoid military service by going into hiding, claiming exemption under another law - often by 'playing the crazy card', by arrangements with the unit itself, or by other methods ('side-door CO'). This means that official figures on the number of COs often do not reflect the reality of CO in Greece. Firstly, it is in breach of Article 6 of UN resolution 1998/77 which reiterates an affirmation made in a previous resolution: "States, in their law and practice, must not discriminate against conscientious objectors in relation to their terms and conditions of service, or any economic, cultural, civil or political rights". Thirdly, it contradicts earlier UN Human Rights Committee decisions, most recently Foin vs France, which found that any disparity in length is only permissible if it is based on "objective and reasonable criteria, such as the nature of the specific service concerned or the need for a special training in order to accomplish that service"
Finally, as highlighted by Quaker Council For European Affairs (QCEA) collective complaint no.8, the punitive length of substitute service is in breach of Part 2, Article 1, paragraph 2 of the European Social Charter which provides that "With a view to ensuring the effective exercise of the right to work, the Contracting Parties undertake; to protect effectively the right of the worker to earn his living in an occupation freely entered upon". According to Article 24, para 2 of the law, in the case of war the measures setting out substitute service can be suspended by the decision of the MOD. COs performing substitute service will then be incorporated into the compulsory unarmed military service. This part of the law contradicts Part 2, Article 18, paragraph 3 of the International Covenant on Civil and Political Rights (ICCPR) which states that "Freedom to manifest one's religion or beliefs may be subject only to such limitations as are prescribed by law and are necessary to protect public safety, order, health, or morals or the fundamental rights and freedoms of others". It is also in breach of Article 4, paragraph 2 of ICCPR, which states that: "No derogation from Article 6, 7, 8 (paragraphs 1 and 2), 11, 15, 16, and 18 may be made [...]". Conscientious objectors having been sentenced for their 'offence' are usually called up for military service again. This practice of trying COs for more than one 'offence' of draft evasion or desertion is contrary to 3 important, internationally recognised standards. Firstly, it violates UN standards on the right to a fair trial. More specifically, regarding conscientious objection, this practice contravenes Article 5 of United Nations Commission on Human Rights Resolution 1998/77 which "Emphasizes that States should take the necessary measures to refrain from subjecting conscientious objectors to imprisonment and to repeated punishment for failure to perform military service, and recalls that no one shall be liable or punished again for an offence for which he has already been convicted or acquitted in accordance with the law and penal procedure of each country." In addition, it contravenes Commission on Human Rights resolution 2002/45 which takes note of recommendation 2 of the Working Group on Arbitrary Detention aimed at preventing the judicial system of States from being used to force conscientious objectors to change their convictions. Further, it is in contradiction to Article 14 paragraph 7 of the International Covenant on Civil and Political Rights (ICCPR): "No one shall be liable to be tried or punished again for an offence for which he has been finally convicted or acquitted in accordance with the law and penal procedure of each country." Although COs are theoretically entitled to free food and shelter, often this is not possible and the prescribed salary of 210.70 is not usually enough - even to cover rent. Indeed, in Greece, welfare payment for unemployed people is significantly more given that the average monthly payment is 320.25 (minimum=311.25; maximum=329.25). This amounts to economic discrimination against COs which clearly violates Article 6 of the United Nations Commission on Human Rights Resolution 1998/77. The majority of COs are required to serve far from home. Law 2510/97, article 19 excludes the Districts of Athens and Thessaloniki from places suitable for an objector to carry out substitute service, and a subsequent ministerial decision (based on the law) added 4 more big cities of high population in the list of this exclusion. The law also excludes COs from serving at the place that he lives, at his place of his origin or at his place of birth (the place of origin and place of birth are considered distinct, so, for example, if a CO were born in a hospital in another town, this town will also be excluded!). It would not be unfair to emphasize that the above wide exclusion rather tends to render the everyday life of an objector as difficult as possible (without access to many facilities), whereas big military units are still around several big cities of Greece. These punitive measures also suggest that the state is trying to eliminate the possibility of a CO serving somewhere that he could have accommodation for free (eg. a relatives' house). So, in practice, COs have to pay rent which means that only the richer COs can perform the substitute service, which clearly discriminates against those unable to pay. Once again, this practice is in contradiction to Article 6 of the United Nations Commission on Human Rights Resolution 1998/77. COs who are in the process of being tried for their 'offence(s)' are refused the right to leave the country and their relatives have in some cases been harassed by police. A recognised CO who does not report for substitute service on time, becomes an "Anipótaktos" (objector to conscription) and is prosecuted under the military law. As an "Anipótaktos" he looses his CO status. This section of Greek CO law is extremely confusing since it leaves COs in a 'limbo' situation between the military and civilian authorities. This is illustrated in the case of Lazaros Petromelidis who was told by a Thessoloniki military court in February 2004 that he could not be tried because he is a civilian. However, since civilian courts have no process for issues related to military law, he was left without recourse to either military or civilian authorities. The legalities of such issues are therefore extremely ill-thought out and confused. According to Article 21, para 2 of the law, the time-frame within which COs serving substitute service must report for duty is determined as starting from the date that a summons from relevant military authorities of the Ministry of National Defence is sent. If a CO does not report for duty by the date stated in the said letter, he faces being charged with insubordination as described above. Given the strict punishment for not reporting for duty on time, it is unreasonable that the summons commences from the date it is actually sent and thus a COs prompt arrival for duty relies on the infallibility of the Greek postal service. Importantly, the period of time given to COs to report for substitute service is not specified by law and is therefore open to any interpretation. A recruiting office can use its discretionary powers to deprive an objector of his right to do substitute service and revoke his status as a CO (provided for in chapter C, article 21, para 5 of Law 2510/97). This occurs as a form of punishment for non-performance of his duty or for a commitment of any disciplinary offence inside the public institution or even for any irregular absence from his duties. This means that even in the event of a one day or a one hour absence, according to the judgment of his supervisor, a CO can have his status revoked. These discretionary powers also apply in the event of a CO participating in trade unionist activities, for example in a strike. In cases such as these where a CO has his status revoked, he is then forced, under Paragraph 6 of the article, to serve the remaining part of his military obligations in the army. However, only half the time spent at the place of substitute service is considered, so that if a CO has done 4 months of substitute service, the authorities consider that he has done only 2 months. In addition to this, in every case, a CO must do at least 6 months of military service, regardless of the amount of time already spent doing substitute service. The same applies in the event that a CO changes voluntarily from the substitute to the military service. This aspect of the Law is extremely discriminatory for 2 reasons: firstly, a disciplinary offence should not result in the loss of CO status, and secondly, according to Article 6 of the United Nations Commission on Human Rights Resolution 1998/77, COs should not be discriminated against so that they lose political rights such as the right to strike or take industrial action. Indeed, the Greek Ombudsman has declared the practice unacceptable and has requested that the MOD withdraw the current provision that allows the recruiting offices to deprive COs of their CO status and call them again to serve a military service. One of the most important issues regarding the problems of COs in Greece is that the substitute service is totally controlled by the Ministry of Defence, even in the initial stage of examining the applications for CO status. Indeed, Article 21, para 3 (b) considers "those who serve an alternative civil service [...] as quasi enlisted in the armed forces". Although the recognized objectors are - supposedly, under the terms and conditions of service - not subjected to a military legal status but remain civilians, the control of substitute service being in the hands of the MOD causes a contradiction with wide-ranging implications, particularly for those who may have their CO status revoked and face trial in a military court! According to the international standards and recommendations, the entire institution of substitute service should have a completely civilian character, so if a committee is provided in order to examine the applications, it should have no military members and should not report to military authorities. As such, Article 3 of the United Nations Commission on Human Rights Resolution 1998/77 "Calls upon States that do not have such a system to establish independent and impartial decision-making bodies with the task of determining whether a conscientious objection is genuinely held in a specific case, taking account of the requirement not to discriminate against conscientious objectors on the basis of the nature of their particular beliefs." Therefore, an independent civilian authority should replace the above committee of the Ministry of Defense, as the Greek National Commission for Human Rights and the Greek Ombudsman have also suggested. Greece has a long history of repression of COs. For decades Greece refused to recognise the right to conscientious objection. Since the 1950's, approximately 3,500 COs have been imprisoned. Initially most were Jehovah's Witnesses, but since the 1980's there has been a growing number of other COs inspired by secular, pacifist, political or other motives. The right to CO was first recognised under Greek law on 1st January 1998, almost 11 years after the first non-religious CO appeared, and it establishes the possibility for a substitute service. Greece was the last EU country to recognise the right to CO. During 1997, about 250 Jehovah's Witnesses were serving prison sentences for exercising their right to CO on religious grounds. In the first 3 months after the law recognising CO came into force, about 80-100 people applied for CO status. Of these, 9 were non-religious COs and the rest religious (Jehovah's Witnesses). By 1999, there were more than 200 COs performing substitute service. Until June 2003, 771 applications for CO status had been submitted, of which 758 were accepted. Before the recognition of CO and since (due to the complexity of procedures and the discriminatory treatment COs face), many potential conscripts and COs have attempted to avoid military service through alternative 'side-door' means. Conscripts may claim exemption by moving abroad for long periods of time, by 'playing the crazy card' (getting certified as mentally ill), by enrolling as students, by arrangements with the unit itself, or by other methods. This means that in addition to the known cases of CO, there are several others which are not officially reported so that often, official figures on the number of COs do not reflect the reality of CO in Greece. Officials estimate the number of Greek men in hiding as between 8,000 and 35,000, but CO support groups estimate the number to be somewhere between 40,000 and 70,000. The lack of transparency regarding the whole process of performing military or substitute service means that often conscripts are not even aware that they have the right to apply for CO status. So, the number of applications for CO status is dependent on the military providing conscripts with the information necessary to make their application in time and be referred to the committee. In August 1999, the Ombudsman for Citizen's Rights (Citizen's Advocate) issued a series of constructive recommendations including: the partial demilitarisation of the substitute service, a decrease in the length of service, the abolition of the unconstitutional possibility to change the status of a CO back to that of a draftee, the introduction of the same special categories of shorter service as for military service and the inclusion of NGO's to the groups of institutions in which such service can be carried out. In 2001, the European Parliament in a resolution, called on Greece to recognise the right to conscientious objection to military service without restriction, and without reference to any religious grounds, to introduce forms of substitute service which do not last longer than compulsory military service and to release immediately all those serving prison sentences in this connection. In the same year, following a collective complaint by the Quaker Council for European Affairs (QCEA), the European Committee of Social Rights concluded that the duration of substitute service amounted to a disproportionate restriction on "the right of the worker to earn his living in an occupation freely entered upon" and violates Article 1.2 of the European Social Charter, as substitute service keeps COs away from the labour market for a time disproportionately longer than conscripts in the armed forces. Also in 2001, the National Committee for Human Rights (an independent administrative authority) asked that the management of substitute service must not be under the jurisdiction of the Ministry of National Defence, and that this service must be 'reasonably' longer than the military service. In 2003, the European Parliament in its Annual report on Fundamental Freedoms in the European Union called upon Greece to recognise the right to conscientious objection without restrictions, to make substitute service the same length as military service and to release immediately all those serving prison sentences in this connection. Some small steps have been taken to bring Greek CO law in line with relevant international standards. For example, in the summer of 2001 there was a reduction in the length of substitute service for some COs according to the period of military service they were obliged to serve before being recognised as COs (instead of an extra 18 months on top of the duration of military service across the board, it became an extra 16 months for those with 1 child, an extra 14 months for those with 2 children and an extra 12 months for those with 3 children). More recently, in August 2004 the law was amended , so that now conscientious objectors complete their substitute service after serving twice the time of military service minus 1 month. However, despite these small steps, for the most part the recommendations of national and international bodies have been ignored. Length of substitute service is discriminatory and punitive. Conscientious objectors should have the right to claim conscientious objector status at any time, both up to and after entering the armed forces. Bureaucratic procedures prevent people from exercising their right to CO. Substitute service must be under civilian authority and not under military authority (Ministry of Defence) - including in the examinations of applications for conscientious objection. Conscientious objectors who carry out trade unionist activities or participate in a strike during their substitute service can have their CO status revoked. As illustrated in this report, the concerns raised above are also raised by United Nations and international recommendations, laws and standards. It is abundantly clear that Greek CO laws, practices and guidelines are not in compliance with such standards. War Resisters' International calls for Greece to recognise the right to CO at least to these standards. This case is interesting because it illustrates several of the problems relating to conscientious objection and the provision of substitute service for Greek COs. His case exemplifies the continuing harsh treatment of COs by the Greek authorities and the extremely time-consuming nature of the legal struggles they face. Lazaros Petromelidis declared his conscientious objection to military service in 1992 before the recognition of the right under Greek law. He was eventually granted CO status in January 1999. He was then ordered to serve substitute service for 30 months - seven-and-a-half times longer than he would serve as a non-CO - in a town 550km (340 miles) away from his family home. Due to this overt discrimination, Lazaros did not present himself for service and appealed instead to the highest court in Greece. Meanwhile, his prosecution for his initial draft evasion was still pending and on April 15 1999, Petromelidis was convicted to 4 years imprisonment. He was released after just 2.5 months after the official Greek Ombudsman clearly expressed in a special report on CO that Petromelidis' requests were justified. Despite this, on being released from prison, Petromelidis was called to start military service again and because he again refused to comply, a further arrest warrant was produced for the same offence. When, on 17 September 2002, Petromelidis appeared in court to ask for postponement (due to the absence of his lawyer) of his trial for not performing the substitute service, he was immediately arrested for a new offence - a second count of insubordination for failing to register for service when called-up by the Navy a few months previously. He was put in prison for 3 days before being bailed. Petromelidis' trial for the initial charge of failing to perform the grossly punitive substitute service finally took place on 12 June 2003 and he was given a 20 month suspended (for 3 years) sentence (out of a maximum of 24). On 18 September 2003 Petromelidis was acquitted of his second 'offence' of "insubordination". However, since then, having lost his CO status, he has been repeatedly called up to perform military service and consequently accused and prosecuted again for draft evasion every time. On 16th December, he was due to appear before the Naval Court of Piraeus on two charges of "insubordination", dating from 26 July 1999 and 3 July 2003. He chose not to appear since if he did, they could arrest him for more recent draft evasions. However, since he did not appear, they sentenced him in his absence to 2 ½ years imprisonment. Once again, Lazaros Petromelidis is under imminent threat of arrest. Lazaros Petromelidis' case highlights the injustice in Greek provisions for conscientious objectors. Lazaros is a married father of an 11-year old son and for the past 8 years he has worked in support of socially excluded groups. He has experienced first-hand the discrimination and poor treatment of COs in Greece. The punitively long substitute service he was prescribed is in breach of Article 4 of UN Commission on Human Rights Resolution 1998/77. It contradicts previous UN Human Rights Committee rulings, for example, Foin vs France, since any disparity in length that discriminates against COs on the basis of their conscience constitutes a violation of the principle of equality set forth in article 26 of the ICCPR. It is also in contradiction to the 1987 Council of Europe recommendation regarding CO.
Lazaros has been tried more than once for insubordination thus violating Article 5 of UN Commission on Human Rights Resolution 1998/77. This is also in contradiction to Article 14 paragraph 7 of the International Covenant on Civil and Political Rights (ICCPR) and UN Commission on Human Rights resolution 2002/45 taking note of recommendation 2 of the Working Group on Arbitrary Detention aimed at preventing the judicial system of States from being used to force conscientious objectors to change their convictions. Further, Article 13 of the Universal Declaration on Human Rights, has been contravened because Petromelidis has been refused the right to leave his country (due to his refusal to serve the punitively long substitute service, his ensuing classification as an "Anipótaktos" and resulting loss of his CO status and prosecution for desertion). Greek CO law excludes whole groups from applying for CO status: there is no case by case decision and the capacity to change one's convictions is not taken into account. Giorgios was a professional soldier with the Greek army. He was ordered to go to the Persian Gulf in May 2003 but refused on the grounds that the war in Iraq was unjust. He left the Navy rejecting it as a mechanism that is used for the repression of people's movements. He was arrested and brought to a military (naval) court without a lawyer on 13th September 2004. He received a sentence of 3 years and 4 months. On 5th October 2004 his demand to be released till the Appeal Court was examined. Monastiriotis was not present at this second "trial" (he was in jail) but his lawyer brought several witnesses, including a former Minister of Justice of the Socialist Party, and Monastiriotis was released until the Appeal Court trial without any conditions. Shortly after this Monastiriotis was called to join the Navy and again he refused. For this 'offence' he was sentenced on 18th January 2005 to 5 months' imprisonment on suspension in case of appeal, for desertion. This means that Monastiriotis has been tried twice for the same 'offence' of desertion. He is currently awaiting the date of his appeal trial. Monastiriotis' case illustrates how Greek CO law is in contradiction to Article 5 of UN Commission on Human Rights Resolution 1998/77 as well as Article 14 paragraph 7 of the ICCPR and UN Commission on Human Rights resolution 2002/45 which takes note of recommendation 2 of the Working Group on Arbitrary Detention aimed at preventing the judicial system of States from being used to force conscientious objectors to change their convictions. In addition, the exclusion under Greek CO law, of professional soldiers from applying for CO status is in contradiction to UN Commission on Human Rights resolution 1998/77 which recognises that "persons performing military service may develop conscientious objections". Felix Alexanidis, an ethnic Greek, was born in Georgia in 1970 but obtained Greek nationality in 1999. From 1989 to 1991 he had performed military service in the Russian army. Following this period Felix Alexanidis moved to Greece and became a Jehovah' Witness. He was then called up to perform three months of military service in Greece, but applied for CO status due to his religious beliefs. However, since the Greek legislation does not recognize as conscientious objectors those men who developed conscientious objection after entering the armed forces, the Greek authorities rejected his application on 22 November 2002. He has appealed to the Council of State where his case is still pending. Since 2002 his case has had 3 postponements, now the new date of his trial has been set for October 2005. Currently he is legally out of the army, because the Council of State has granted him suspension of his military duties until the decision on his case. In not allowing for the capacity to change (or only allowing it in the direction of the military), the exclusions set out in Greek CO law result in genuine COs being denied their status. The denial of CO status to Felix Alexanidis is in contradiction to UN Commission on Human Rights resolution 1998/77 which recognises that "persons performing military service may develop conscientious objections". These cases highlight the fact that at present, bureaucratic procedures prevent people from exercising their right to CO. These COs - all of them Jehovah's Witnesses - were denied the opportunity to apply for their CO status because in each case the authorities failed to provide the necessary documents in time and therefore the men didn't have the full documentation to pass on to the military to claim their CO status. It is clear from these examples that the procedures CO applicants must complete in order to be given their CO status are inadequately thought out and result in several cases in genuine COs being denied their rightful status. the practice of trying COs more than once for the same 'offence'. Ioannis Chryssovergis was called up for enrolment in the Greek army in March 1988 and was suspended from military duties for one year on grounds of ill-health. On 25 August 1989 he wrote to the Athens enrolment military office declaring his conscientious objection to military service and in January 1990 he refused to report for military duties when he was called up in Thebes. In 1992 he was charged with insubordination. On 1 January 1993 he was banned from leaving the country. In March 1998 he applied for CO status and in June 1998 he was recognized as a conscientious objector and called to serve 30 months of substitute service (instead of 3 months of military service - given the right to buy exemption from 9 months of a 12-month service without being granted the right to pay a sum of money in lieu of part of that service, as provided by law for the military service). He started his substitute service in Sidirokastro on 8 December 1998. On 13 February 1999 he applied to the State Council in protest at the discriminatory treatment against conscientious objectors and requested that he should be allowed to pay a sum of money in lieu of part of his substitute service and that the length should not be punitive. On 8 June 1999 he walked out having served six months of his substitute service (twice the length of the military service he would have served). He was repeatedly called up to serve 12-month military service and he has refused to enrol. As a result, he is apparently at risk of arrest and imprisonment on charges of insubordination or desertion. Once again, the punitively long substitute service prescribed in this case is in breach of Article 4 of UN Commission on Human Rights Resolution 1998/77. In addition, it contradicts previous UN Human Rights Committee rulings, see Foin vs France, and the disparity in length constitutes a violation of the principle of equality set forth in article 26 of the ICCPR. It is also in contradiction to the 1987 Council of Europe recommendation regarding CO. Being tried more than once for the same 'offence' violates Article 5 of UN Commission on Human Rights Resolution 1998/77 and is in contradiction to Article 14 paragraph 7 of the ICCPR as well as to UN Commission on Human Rights resolution 2002/45 taking note of recommendation 2 of the Working Group on Arbitrary Detention aimed at preventing the judicial system of States from being used to force conscientious objectors to change their convictions. WRI "CO in OSCE member states", page 5, 2003. Article 18, paragraph 4 (a): "those who have carried arms for whatever length of time in the Greek or foreign armed forces or in the security forces" cannot be considered as conscientious objectors. UN Commission on Human Rights Resolution 1998/77, Article 3, calls on states to "establish independent and impartial decision-making bodies with the task of determining whether a conscientious objection is genuinely held in a specific case". United Nations Commission on Human Rights (1998), Resolution 1998/77: Conscientious Objection to Military Service, article 6, states that "States, in their law and practice, must not discriminate against conscientious objectors in relation to their terms and conditions of service, or any economic, cultural, civil or political rights"
 Law 2510/97 article 21 paragraph 7. United Nations, International Covenant on Civil & Political Rights, Consideration of Reports submitted by state parties under article 40 of the covenant, initial report Greece, para 688, 5th April 2004. WRI "Refusing To Bear Arms" report on Greece, 1998. European Parliament: Report on Fundamental Freedoms in the European Union, January 2003.